BEDSLIDE - The Topper Shop Inc. 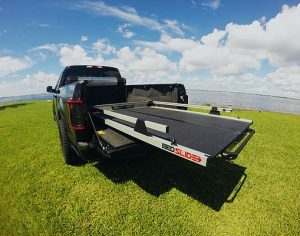 The BEDSLIDE CLASSIC is the perfect solution to accessing your truck bed and sliding all you stuff right from under your tonneau cover or truck cap. It holds 1000lbs evenly distributed and is backed by a LIFETIME warranty. Whether you need an everyday workhorse on the job site or an efficient way to get all your gear to the campsite, the CONTRACTOR is the ultimate in heavy-duty cargo management. Built for professionals, sportsmen and outdoor enthusiasts, the BEDSLIDE has innovative features to make loading, transporting and accessing your equipment quick, simple and safe. There are times when life requires you to go the extra mile. So we’ve gone to great lengths to bring out the best — with BEDSLIDE HEAVY DUTY, the easiest way to load and unload your truck. Carry up to 2,000 lbs. of gear and supplies — that’s a ton of fun. CALL TODAY FOR A PRICE! !